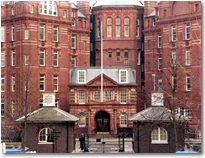 The Cruciform Building is in red brick, and has fancy towers. But at present it is covered in builder's scaffolding, and you might not recognise it from the photo. It is directly opposite the main entrance to UCL. Registration is from 8:30-9:15 on Monday 10 August. Do NOT come to the Phonetics department, which is 1 km away and will not be used for SCEP. Come and spend two weeks in London this summer, studying English Phonetics at University College London (UCL). If you have good prior knowledge of English phonetics � whether you're an EFL teacher/student or a native speaker of English � you maybe able to enrol in the IPA Certificate strand to prepare you for taking the International Phonetic Association's Examination for the Certificate of Proficiency in the Phonetics of English. The IPA examination will be held on Monday 25 August 2009 at UCL. There is an entrance test for admission to this strand (see below). At UCL we are enthusiastic about the study of pronunciation and how to teach it. We are the world's leading university department for English Phonetics�our tradition was established by Daniel Jones, and continued by A.C.Gimson, and J.C.Wells, all scholars with a world-wide reputation. We are also a leading centre for teaching and learning innovations in phonetics, and host the biennial international Phonetics Teaching and Learning Conference. PTLC2009 will take place 6-8 August, immediately before SCEP. In the IPA strand, we prepare participants for the IPA Certificate of Proficiency in English Phonetics, which includes general phonetic ear-training and theory alongside English-related material. This strand presupposes a sound knowledge of phonetic theory (as set out in books such as Speech Sounds � see recommended reading page ), including the detailed description of articulatory movements in short stretches of connected speech. The course ends with a chance to take the exam. It is essentially a two-week intensive revision course with a strong emphasis on the practical skills required (ear-training, production practice and transcription); basic knowledge will be assumed, and teaching will focus on consolidating key points and issues.